Soon after Columbus discovered America, the banana was brought from the Canary Islands to the New World. Today, the nutritious fruit has become so widespread that it is one of the world's most important food crops, especially varieties of Musa sapientum , which produce the bananas that we buy at the grocery store. Wild bananas, found throughout Southeast Asia, are mostly inedible to humans as they contain little fruit and many hard seeds. The bananas we eat are seedless. It is believed this mutation was first noticed and nurtured by humans 8,000 to 5,000 BCE. Archeological findings suggest humans in the Kuk Valley of New Guinea may have been the first to domesticate the plant. Other evidence suggests that spontaneous domestication may have also occurred in other parts of Southeast Asia and the South Pacific. From there, domesticated Musa plants were carried across the tropics and cultivated for hundreds of years. Bananas do not grow on trees! The plant's long, broad leaves are supported by a single, stout structure called a pseudo stem which looks like a tree trunk, but is not. 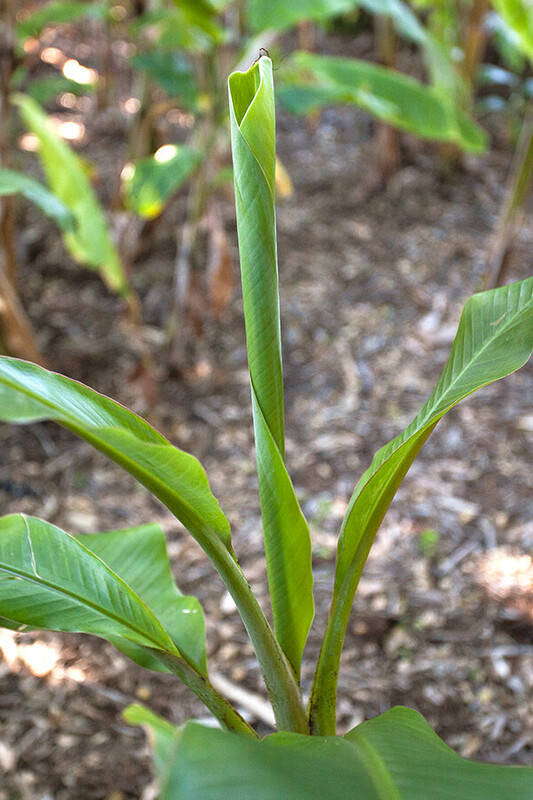 Banana plants are actually considered giant herbs. They are herbs that bear fruit—which means that, botanically speaking, the fruit is a berry. Domesticated bananas, being seedless, reproduce by sprouting new growth from the rhizome. A single leaf, tightly curled like a cigar, breaks ground. As the plant grows, more leaves emerge from the center of the plant. Generally, a banana plant produces around 40 leaves before fruiting. Asked to draw a banana, most people would sketch something resembling a curved cylinder narrowing to a point at both ends—the thing we see in the produce section. Yet among the well over 1,000 types of domestiated bananas, there exists a range of fruit shapes and sizes. Some are round as a bowling ball, or short and thick, perfectly straight, or pear shaped! The long, broad leaves of a banana leaf are supported by stiff ribs. The veins in the leaves do not branch as in some other plants, making them tear easily when disturbed. But torn or whole, the wide leaf does the all important work of collecting the sun's energy. Being tropical plants, bananas require great quantities of water, heat, and rich humus-type fertilizers. 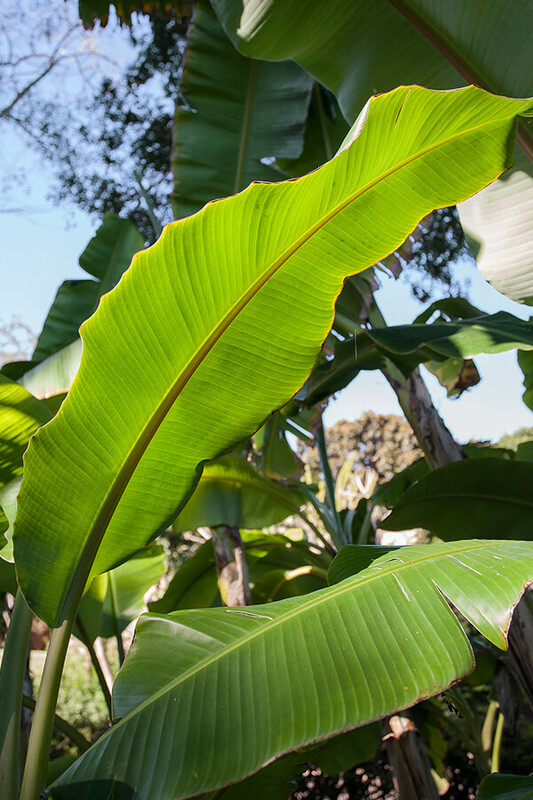 In warm climates like those found in the southern US and many Mediterranean countries, growing bananas is a popular pastime for gardening enthusiasts. 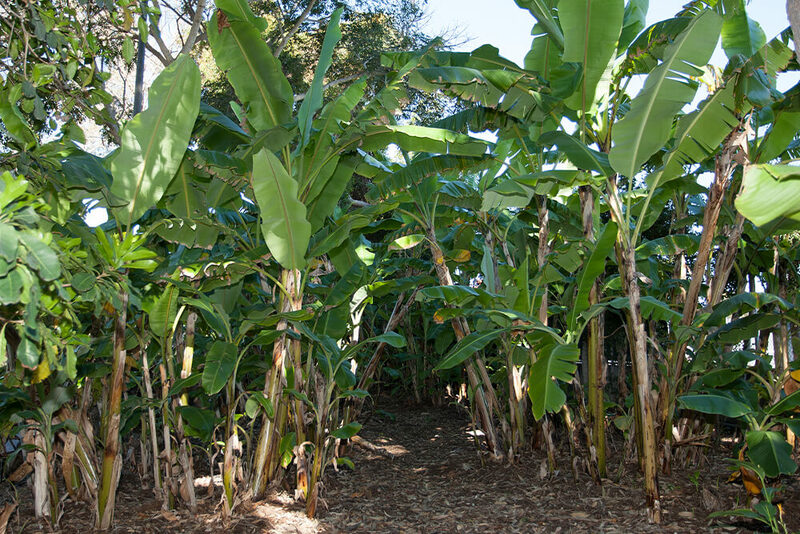 The San Diego Zoo cultivates 24 types of banana plants on its 100-acre grounds. The leaves and stalks are harvested and given to our primates and elephants as browse. The fruit sometimes supplements the commercial bananas purchased to feed a variety of animals in the collection. 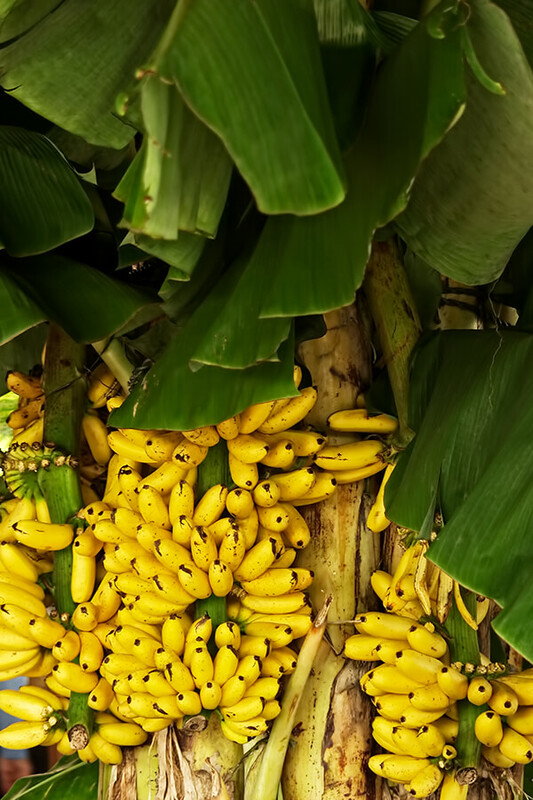 In our Mediterranean climate, it takes a good 2 years for a banana plant to reach the fruiting stage, whereas in the tropics it takes 12 to 14 months, depending on the variety. Starchy plantains are cooked before being eaten. They have a low-moisture content (65 percent on average), contain little sugar, and are not good eaten raw. Bananas contain more moisture (83 percent on average) and a higher sugar content, which makes them delicious to humans when eaten raw. And there's more to a Musa plant than the fruit! The leaves are widely used for wrapping food to be steamed or even for storage. They are also sometimes used as plates or to line cooking pits. In some places, fiber from the pseudostem is woven into a thin fabric used for clothing and floor coverings. 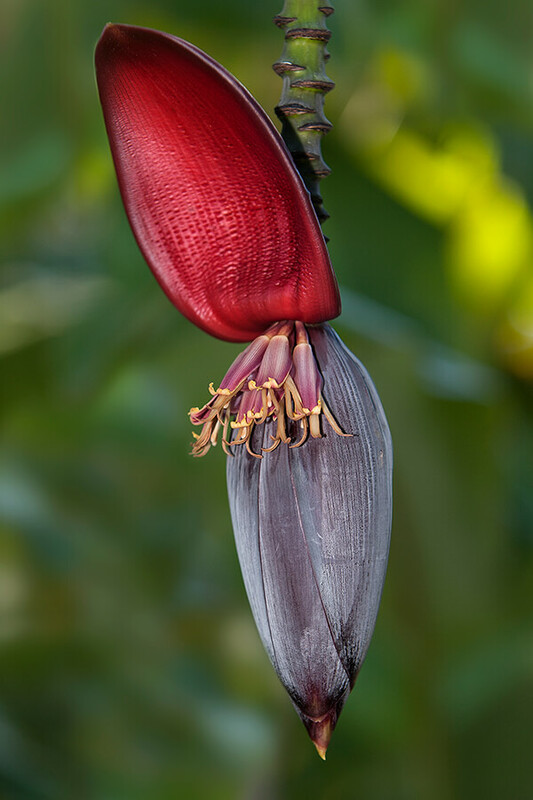 Banana blossoms are a common ingredient in certain Asian cuisines, and all parts of the banana plant have be used medicinally in a number of cultures. 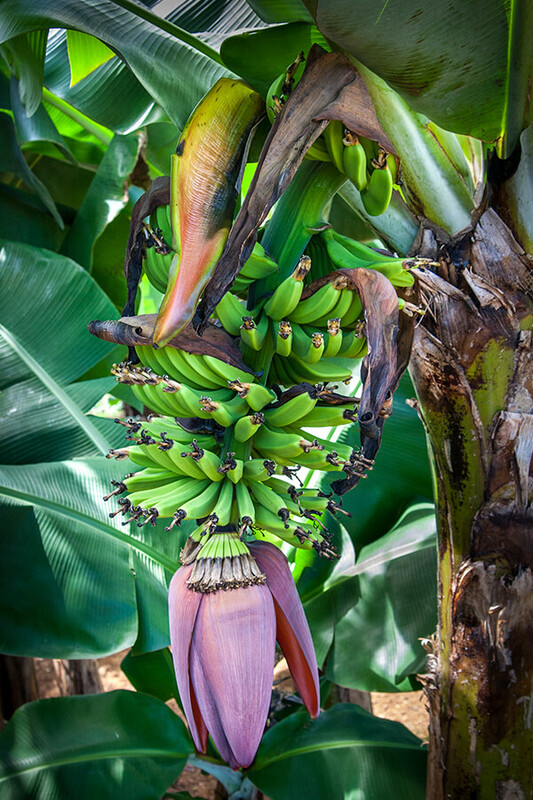 Because of its continuous reproduction, the banana plant is regarded by Hindus as a symbol of fertility and prosperity. The hapai banana is astonishing! The name means "pregnant" in Hawaiian; the fruit develops inside the trunk of the tree! An abundance of fruit flies and ants on the plant is a signal that it's time to cut open the stalk and harvest the fruit.